With theater seats custom-crafted to match your exacting vision, art direct the special effects and accessories that’ll set the perfect scene in front of the screen. 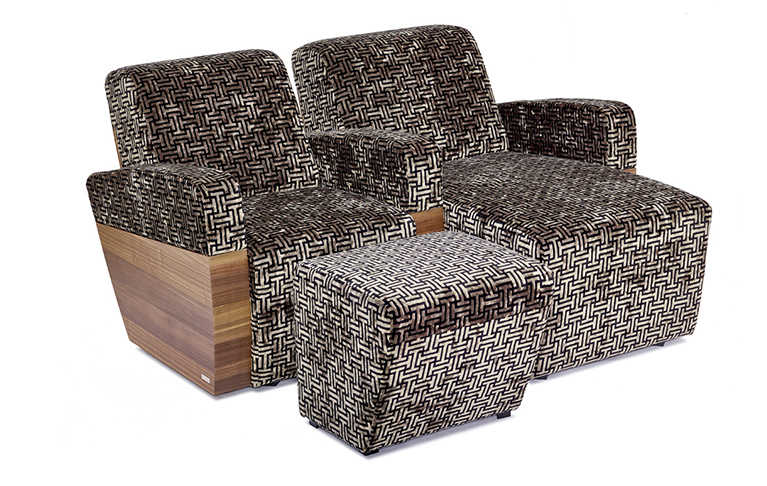 Built to order, our cinema chairs are delivered in weeks, not months. Try this on for size. Most of our theater chairs come in the following dimensions: a 7.8” (20 cm) armrest, a 12” seat (56 cm), and a 9.8” (25 cm) straight middle arm rest or 7.8”/11.8” (20/30 cm) curved middle armrest. But you can change the height, width, and depth parameters of our cinema seating without impacting lead time notably. We even have daybed or chaise lounge variations to fit any media room design—and to match your movie-watching style. It’s a real motion picture. All theater seats are available in five different versions: Static without mechanics—meaning no seat position adjustment. Manually operated with a spring-based mechanism. Or with whisper-quiet engines and mechanics made by Lusch—a leading German furniture engineering firm with over 70 years of expertise. 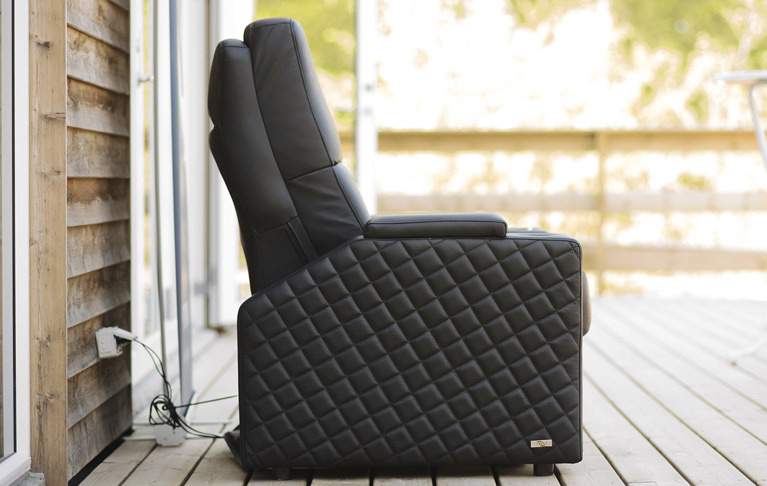 A one-engine option controls the cinema chair’s foot and backrest together. A two-engine option moves the foot and backrest independently. Or a three-engine version offers separate controls for the foot, back, and headrest. 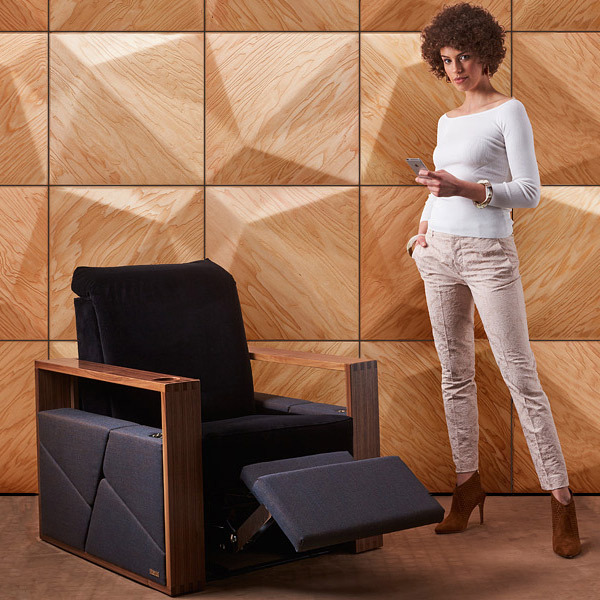 Quite a cushy task, it’s like you’re the Goldilocks of theater seating. Soft or hard, you choose the grade of cushioning, so your cinema chair turns out just right. Make every movie a totally electric experience. Plug your theater seat right in (110/220V). Or power up your cinema chair using a rechargeable battery. Get a power player of a recliner to energize your media room. Lit from within, literally, our theater seats can come with four potential LED lighting sources that offer ambient light ranging from cold or warm white to the full RGB spectrum. 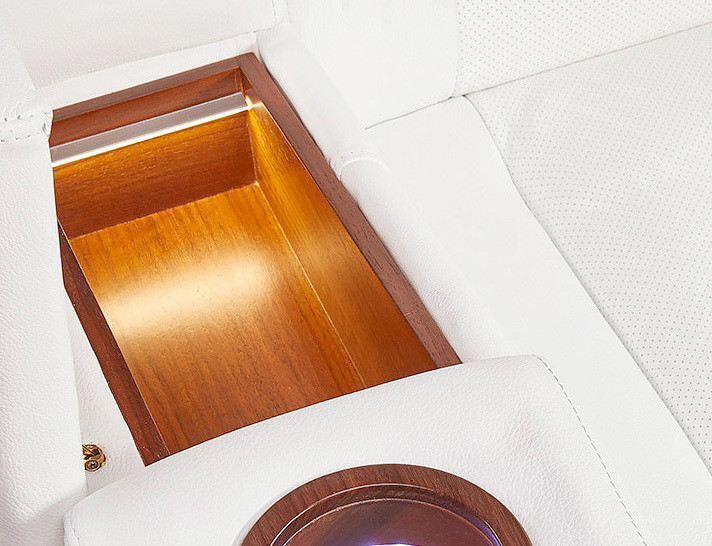 Light up the cup holder, the storage compartment in the end and middle armrests, the side panel at the end armrest, and/or create bottom lighting underneath the end and middle armrest. 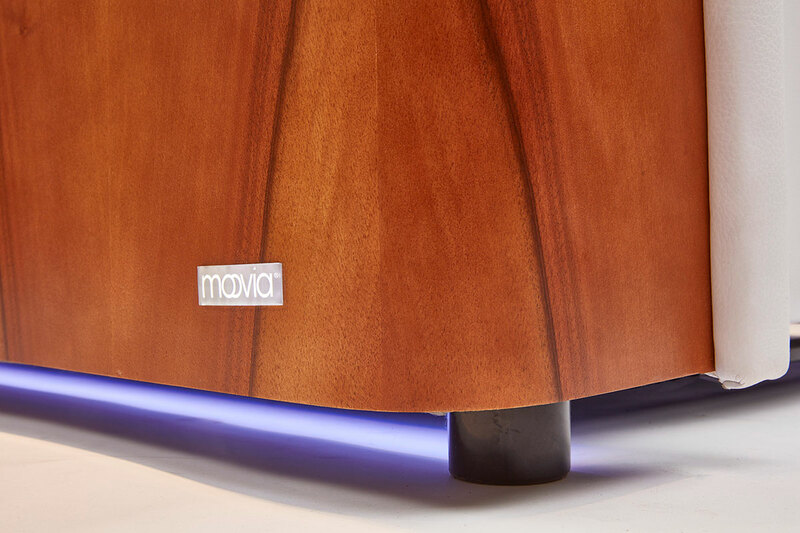 Lighting sources in your cinema chair can be controlled by in-built touch panels, buttons, remote controls, or the Moovia mobile phone app. Give your media room more atmosphere. Create your own ideal conditions right from your theater seat with cooling, heating, or both built right in. We use elite automotive technologies with perforated leather or fabric upholstery for a climactic movie-watching experience. Sit back, relax, and watch the show in spa-style. Our air massage mode offers up to 10 minutes of an up-and-down, back-relaxing rubdown right from your theater seat. Also enjoy three-point lumbar support for your upper, lower, and middle back. Need a masseur? No, just a media room designed to help you unwind. Don’t let your headrest block the movie’s sound effects. Designed to enhance the impact of your theater’s surround sound system, our headrest flips the audio transmission equation on its head. Available on select models, turn down the high point of the headrest so you can better hear the sound quality in your media room. Motorize your theater seat to match the intensity of your movie. 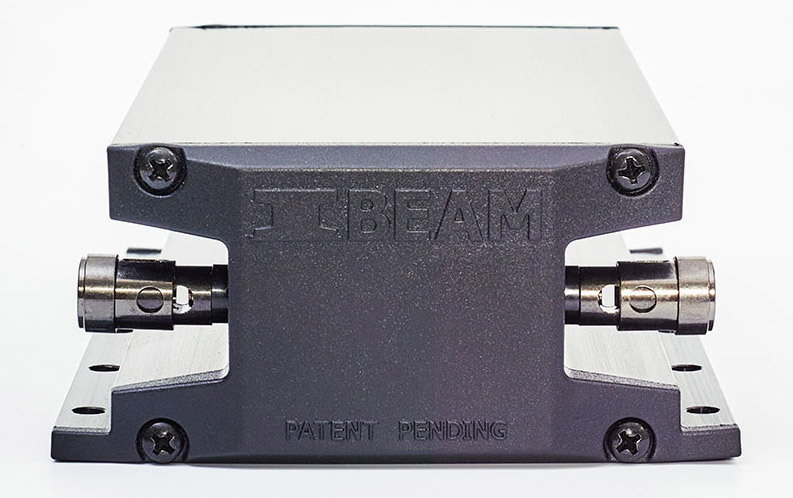 Using D-BOX technology, this motion system creates the effect of movement timed precisely with the action on screen, so you feel you’re tilting back and forth or moving up and down. Your cinema chair will even vibrate and shake in time with explosions and other kinds of action sequences. The perfect sidekick for any theater seating star. Available in premium wood, leather, and upholstery to match your cinema chair, we make end tables, side tables, or accent tables to complement your media room furniture design. Leave it to your own devices. Give your phone or tablet a power boost, even when kicked back in your home theater chair. Wired or wireless, make a charging station in your cinema seat. With an optional KNX interface, integrate the controlling of your theater seat functions and features to any home automation system, like RTI or Crestron. (KNX is a standardized, OSI-based network communications protocol for building automation.) Become the ultimate director of your home cinema. It’s a real stretch. You can also call it a chaise lounge or sometimes ottoman, but we call the longchair an extended seating option for the theater chair models Venice, Berlin, Stockholm, Chesterfield, and Boston. Feel the beat from the comfort of your theater seat. A tactile transducer or “bass shaker” is a device made so that low bass frequencies can be felt as well as heard. It’s a cinema chair with a pulsing bass line that’ll rock your world—or at least boost your movie watching experience with good vibrations. Let your theater chair take your beverage order. 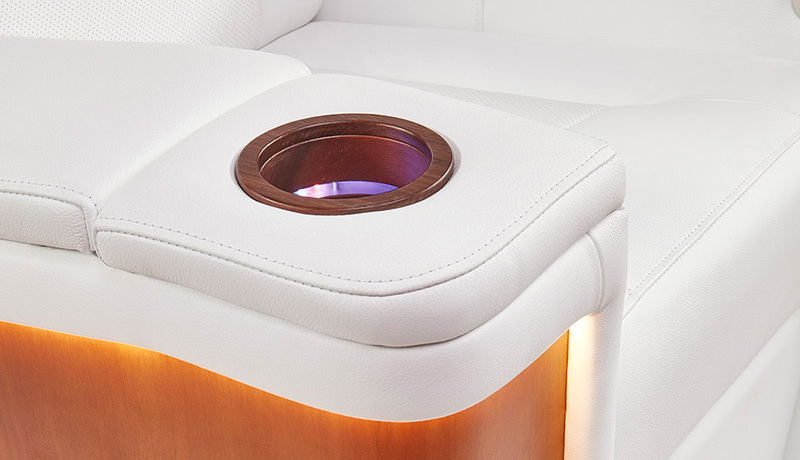 Supply your cinema seat with a style that holds up by getting a cupholder in a standard black plastic or in wood with oak, European walnut, or American walnut. It works even if your cup is a wine glass. It’s where to put your props. A real stow away, deck out your theater seat with storage right in reach. Set right into your cinema chair armrest, get your on-hand cubby-hole in standard black wood, oak, European walnut, or American walnut. 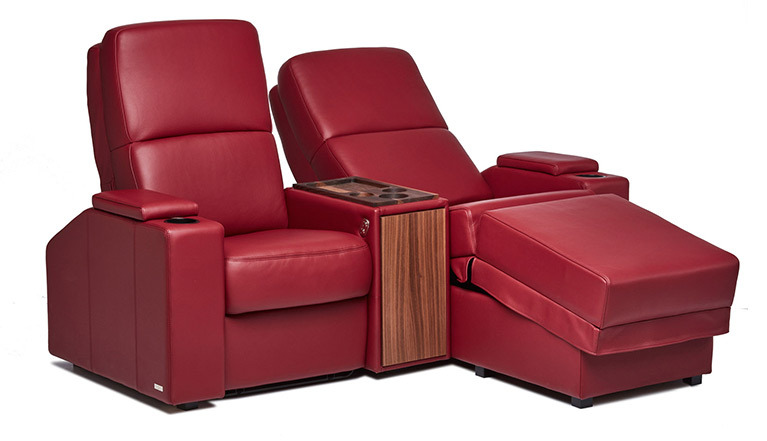 We only build incliners, not cheaper recliners, because this allows the theater chair to fully incline into a horizontal position with only 7 inches of back space needed behind the cinema seat. How relaxing is that? 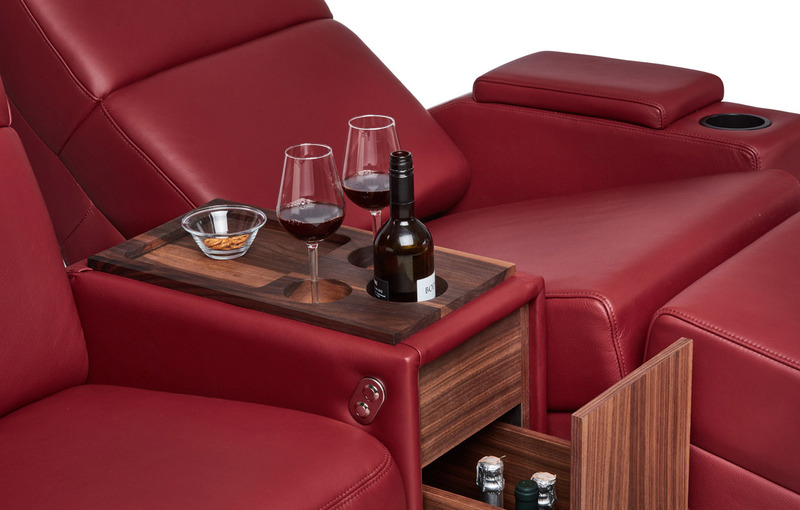 Sit back and enjoy all the functionality of our luxurious theater chairs with the tap of a screen. 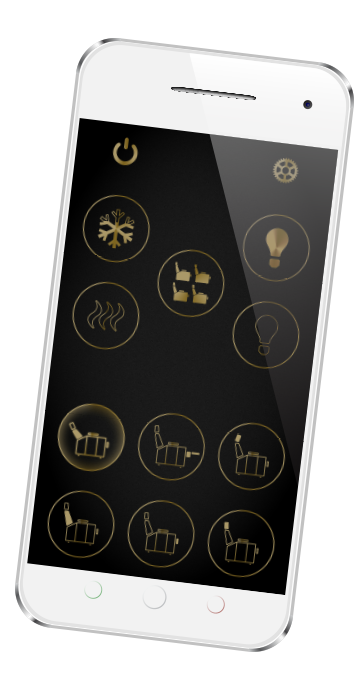 The ultimate control is in your hands with the simple, easy-to-use smartphone app for iPhone and Android. 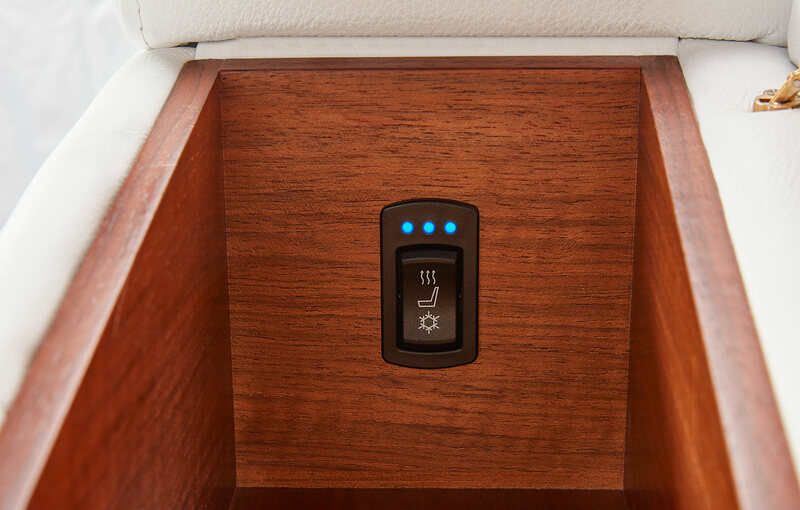 It allows you to adjust the cinema seats to your exact needs, including synchronized movement, lighting, and temperature controls.